JILL, WHERE DID YOU GO? Well it’s been a while but I’ve been so busy enjoying and loving every single minute of my life. Where do I start…working fulltime well over 40 hours & 6 days a week, working with varying degrees of disability from the multiple sclerosis that of course I have kept secret from my coworkers so I have to make-up stories, every six weeks leave work at lunch to go get injections in my eyes that keep me from going blind then return to work looking like I’ve been stung by a bee in both eyes, attend every single one of our boys activities eg: sports, band, choir, etc, cooking dinner nightly though none of us are able to sit down together, cooking breakfast every Sunday making sure we all sit down together for a family meal, cleaning house, doing laundry, bathing dogs, picking up dog pooh…No, no, wait a minute…that was all in my prior life before I stopped working March 2006. Was that really me or was it all a dream? What happened? A few days ago while doing my daily whining to (or at) my husband Steve, honestly I don‘t remember what I was whining about, possibly having to get up before noon or maybe I did not have time to cook dinner because I was too busy working on the computer playing “Candy Crush” or “Disney’s Words of Wonder” or something equally important, anyway I had one of those hit yourself on the head duh moments. I don’t remember Steve’s exact words but I remember him voicing concern about me going in a downward spiral. Of course I remember thinking NOT ME! Well maybe me. Well ok yes me. Then it hit me yep seems since I quit working in 2006 I have perfected the art of whining and the art of Lazy, yes with a capital L. The first couple years I was off work I kept busy watching our granddaughter and visiting daily with my Dad, sister-n-law & a close friend all who had terminal cancer. After that it’s a blur and I have no idea when IT happened. Yes, I’ve had a few major multiple sclerosis blips here and there since stopping work but I had major blips in the past and never gave up or I should say never gave in. Since my multiple sclerosis diagnosis January 1986 one consistency in my life has been Steve diligently tracking the amount of time that I am down or depressed over the ever changing pattern of this unpredictable disease. Not if but when a relapse rears it‘s ugly head I generally pout quietly for a day or two then Steve says “ok time to move forward” or “it’s been 1 (or 2) day(s) you have one more day then you need to move on“. No doubt there are those saying wow what a rude man she is married too. Quite the contrary. Steve is literally why this gal is not bed ridden. I could have very easily laid down and mentally given up. Unfortunately I went unchecked for a while since no longer working and that is exactly what I was starting to do, mentally give up. Sleeping, eating and the occasional computer game had become my only activities. I was to the point where writing or blogging was even something I couldn’t seem to make time for. Recently a lot has changed in our lives and we have a multitude of things to be truly thankful for including our youngest son Michal proposed to his girlfriend Danielle on Thanksgiving and they are getting married in July, our oldest son Jason has gone back to college to get his degree while working fulltime and Steve and I moved. Not even these awesome events shook my “down in the dumps” attitude probably because I chose not to admit I was sliding further and further from life. So I am back and my goal is to blog frequently even if I don’t have much to say and I will try not to ramble on and on. I also hope to complete two more of my mini memoirs in the next year. Hopefully while I work towards getting myself back on track some of you will want to share your stories. Steve is nothing short of awesome and has stood by me thru good times and times that I truly don’t believe some folks could even fathom. He is my ROCK! My entire family is amazing and they have helped me thru some very difficult situations and always with compassion and most importantly in our house, a sense of humor! JILL, WHERE DID THIS NEW FOUND CONFIDENCE COME FROM? Writing my memoir “WISH IN ONE HAND” has changed my life and given me a confidence I did not realize had been lost somewhere along my 53 years. No I have not sold a million copies and Oprah is not knocking on my door. I found something that I love doing, something just for me! I lose all track of time and am shocked when I look at the clock and see I have been writing for 5 or 6 hours. I wake up at 2:00 am, think of something and have to write it down. Last night I woke up, had to write some things down then started putting together notes for my second mini memoir. Then I had an idea for the cover and of course had to handle that as well. I wound up working on the next 2 mini memoirs in the series. I absolutely love it and lose all track of time!!! My dreams growing up were simple I wanted to be a wife and mom, actually I wanted to be Samantha from “Bewitched”, the witch part would be a bonus but I was pretty sure that would not happen 😉 Obviously I am still both but rolls change as we get older. Since our boys left home and then a few years later I was able to retire from working after 29 years it seems my resolve had slowly weakened over time. Plain and Simple I became lazy both mentally and physically. This has nothing to do with family and everything to do with me. My family and in particular my husband Steve have always been loving and supportive in everything I do. When multiple sclerosis rears its ugly head Steve does what needs to be done, takes the bull by the horns so to speak and never complains. I don’t believe anyone can truly understand just how difficult life can be on a well spouse unless you have experienced the challenges first hand. I love to write poetry but never thought I could be a writer. I was wrong. I might be just one in a million writers but for me I am the only one that matters. 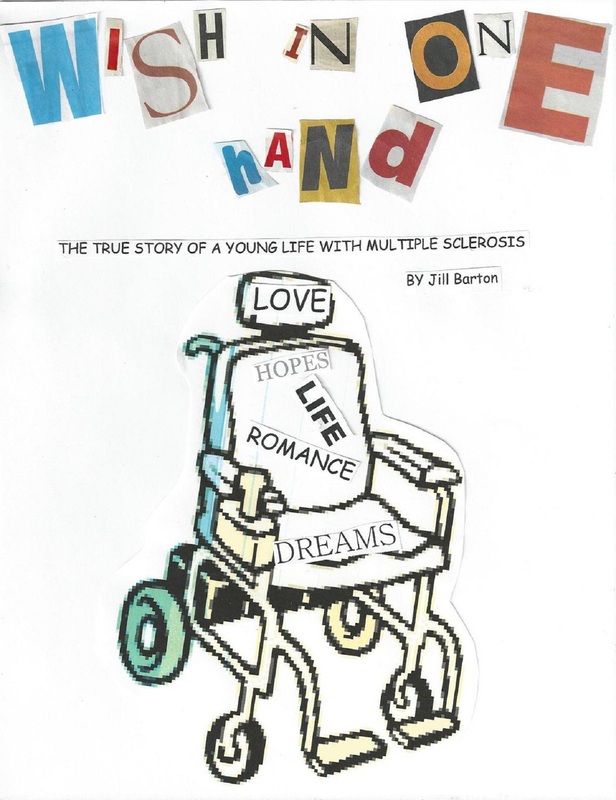 My new book “WISH IN ONE HAND” is now for sale on Kindle & Amazon.com, iBookstore, Sony, Kobo, Copia, Gardner’s, eBookPie & eSentral for just $2.99! PLEASE CHECK IT OUT & let me know what you think. I will let you know when it becomes available on Barnes & Noble Nook. Thanks Everyone! Had my first colonoscopy today & though it was definitely not the funnest thing I’ve done it was not nearly as bad as I had imagined. You might be asking why on earth would she share such personal info & also tell you that Since January 1, 2013 I have been on a mission to complete all the appropriate routine tests & exams for my age & gender including a yearly physical complete with pap, mammogram, colonoscopy, mri of brain for ms & even got my teeth cleaned. To be honest in my younger years I would have been far too embarrassed to speak a word of this to anybody. In recent years I have watched several family members & friends battle cancer & sadly watched far too many take their last breath. In all cases simple routine tests or exams could have detected the cancers early for a better prognosis. I have no problem reminding everyone the importance of getting the pertinent exams/tests for their age & gender & now I can say if I can do it, you can do it! One test that I feel is very important but is not on the standard routine list, a simple blood test called CA125 which can detect ovarian cancer. The CA125 is not usually considered routine & in some cases is even frowned upon by insurance companies & even some doctors because it a test known for showing false positives which can lead to unnecessary testing. My sister-n-law asked about the CA125 about a year before she was diagnosed with stage 4 ovarian cancer & about 2 years before she passed away but was told insurance did not cover it. After she was diagnosed we were told the CA125 would have detected the ovarian cancer early. One of our dear friends kept putting off his age 50 colonoscopy because there was never a good time for him to take off work. He finally got that routine colonoscopy, they found cancer & he passed away a few months later. So EVERYONE please don’t forget to get the appropriate gender & age tests & remind EVERYONE you know. Offer to buddy up with someone or go with someone for support just do not put it off & do not allow your friends & family to put it off. Today is an awesome day! I just self-published my first memoir for ebook readers!!! It will sell for $2.99 and will be available on most ebook readers in less than a month, give or take a week, including Apple Ibookstore, Kindle, Nook, Sony Reader Store, Kobo & a few more. Please note this is basically the same memoir I had posted previously on my blog so please don’t purchase if you have already read it, of course unless you just want a copy on your e-reader. If you had already read the memoir on my blog & you just really want to read it again I would be happy to forward you a copy of the final draft that is in word format, not that I think I am a writing genius because I am not, just want to be sure no one thinks I am trying to pull a fast one. I just finally decided to “go for it” and good or bad fulfill a dream of writing a memoir and getting it published.